Cricket Wireless today announced the Hydro Plus. The Hydro Plus is the latest waterproof Android smartphone from Kyocera that can withstand up to 30 minutes in one meter of water, in addition to blowing rain and dust. It features a 3.5-inch 480 x 320 display and comes with a 1.0-GHz Qualcomm Snapdragon processor with 512MB of memory, 2GB of internal storage, and support for microSD cards up to 32GB. The Hydro Plus includes a 3.2-megapixel camera with LED flash, Stereo Bluetooth (2.1+EDR), Wi-Fi, and GPS. 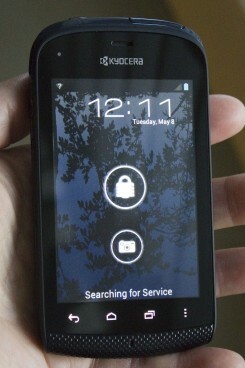 Other features include a three-axis accelerometer, a number of sensors, and Kyocera's "Eco Mode" for power management. 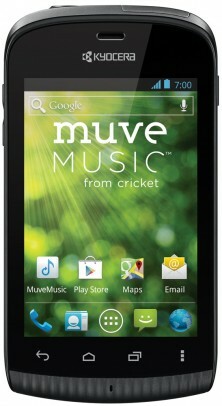 The Kyocera Hydro Plus is compatible with Cricket's Muve Music plan, which starts at $50 per month. The Hydro Plus costs $139.99, and does not require a new contract. It will be available in the coming days. Boost Mobile today announced that it will sell the Kyocera Hydro starting August 3 for $129.99. The Hydro, which was announced earlier this year, is a water-proof Android 4.0 smartphone that includes a 3.5-inch display, 3.2-megapixel camera, Wi-Fi, GPS, and 1GHz processor. The Hydro will be available from Boost Mobile's web site and company-owned stores at first, but will reach select other retailers later in August. Kyocera has a lot of experience with waterproof phones, both from its rugged walkie-talkie phones for Sprint, and its Japanese phones. Now the company is bringing that waterproof know-how to an affordable Android phone with the Hydro. We spent some time with it. Read on for our first impressions. Kyocera took the wraps off two new phones today, the Hydro and Rise. Both phones share a similar feature set, though the form factors differ significantly. Shared features include 3.5-inch 320 x 480 IPS LCD displays and 1GHz Qualcomm processors with 512MB of RAM and 2GB of internal storage. Other specs include EVDO Rev. A 3G and 1X Advanced; 3.2-megapixel cameras with LED flash and video capture; aGPS, Bluetooth 2.1+EDR, and Wi-Fi; a bevy of sensors, and 1500mAh batteries. Both phones run Android 4.0 Ice Cream Sandwich. Hydro: The Hydro is a small bar-style device that is water resistant. Kyocera brings plenty of water-resistant know-how to the Hydro, which can withstand water jets for up to three minutes and immersion in 1 meter of water for 30 minutes. Rise: The Rise is a sideways slider with a QWERTY keyboard for messaging, but loses the water resistance enjoyed by the Hydro. Kyocera did not announce pricing nor availability, nor did it say which carrier will offer these phones; however, Sprint is typically the carrier to offer Kyocera devices in the U.S.